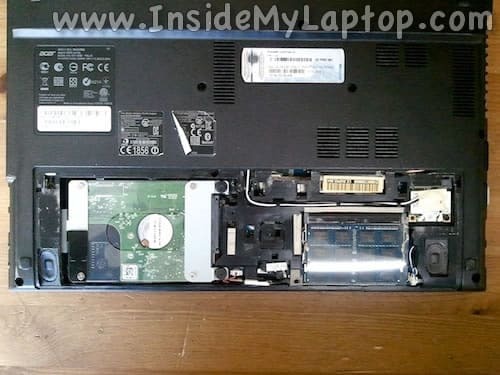 When the service cover removed, you can get access to the hard drive and both RAM modules. 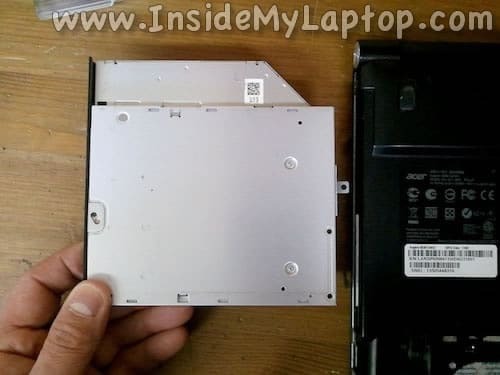 It’s not necessary to remove the hard drive for the purpose of my disassembly. I just show how it’s done in case you need it. 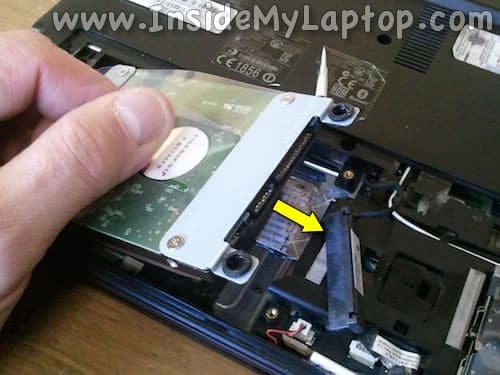 Lift up the right side of the hard drive and disconnect the cable. 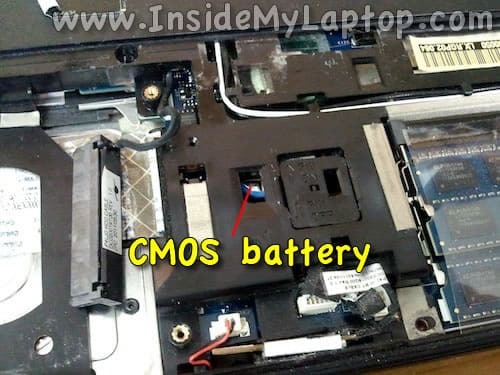 By the way, in Acer Aspire 4830T the CMOS battery buried deep inside the laptop. You can see the battery through the opening in the case. 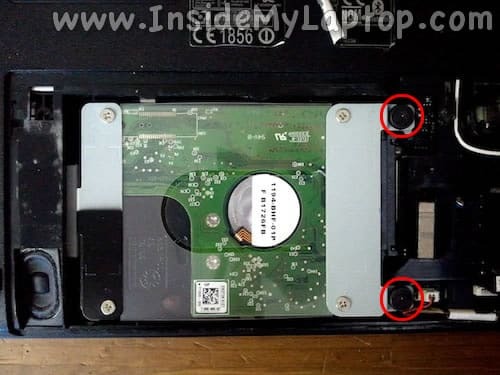 Insert a small flat head screwdriver between the optical drive and bottom case. Carefully pull the drive out of the case. 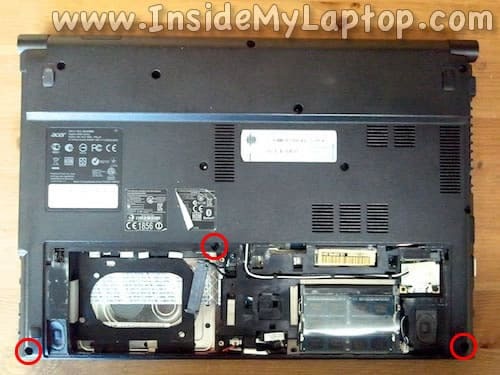 Note: it’s not necessary to remove the optical drive for the purpose of my disassembly. I just show how it’s done. Lift up the palm rest assembly as it shown on the following picture and carefully turn upside down. 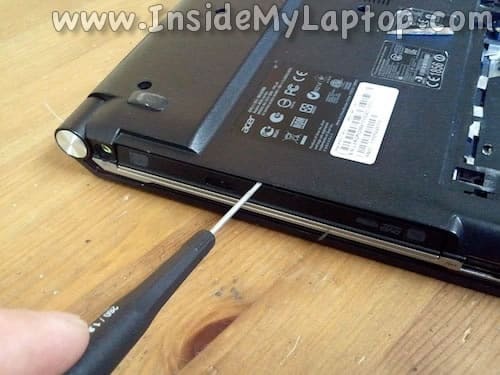 Before you can remove the palm rest completely, it’s necessary to unlock and release the track pad cable. Lift up right side of the cable retainer (brown piece) with the fingernail. Now you can pull the cable out of the connector and remove the palm rest. 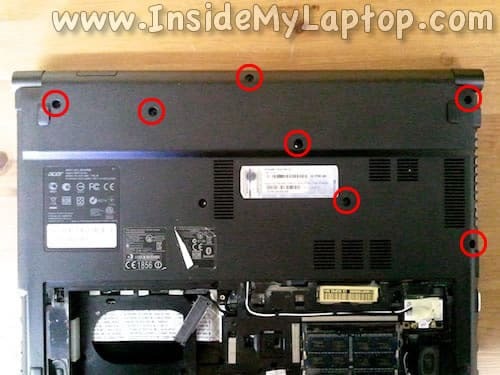 Remove three screws securing the keyboard assembly. 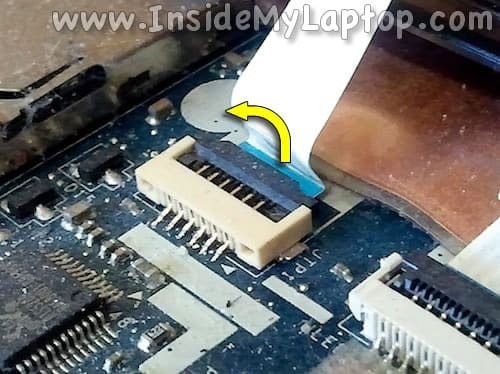 Disconnect two keyboard cables from the motherboard. The left connector can be unlocked the same way as we did in steps 12 and 13. 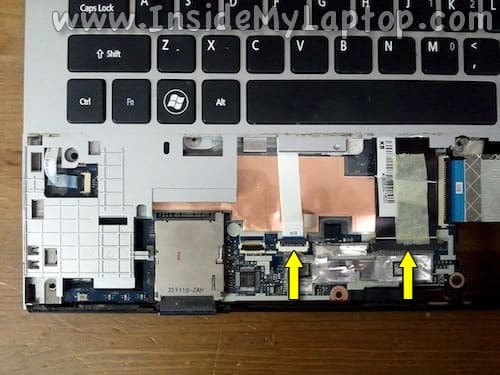 Here’s how to unlocked the right connector. The retainer must remain connected to the connector base. Now remove tape securing the connection and pull the cable from the connector. Lift up the keyboard assembly. 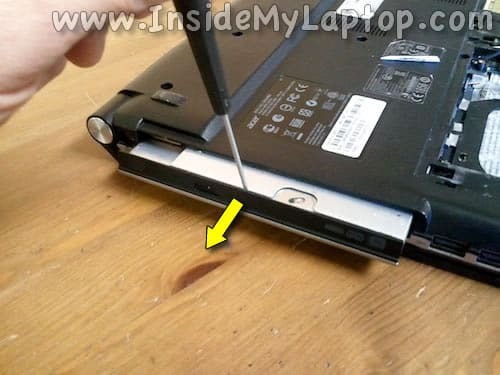 and remove it from the laptop. 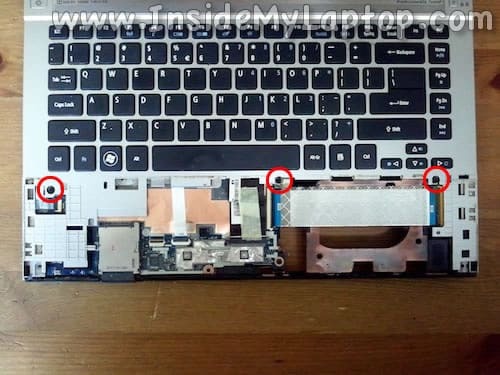 If you need to replace the keyboard, it will be necessary to remove the mylar cover and screws securing the keyboard. I do not show this procedure in this guide but it shouldn’t be very difficult. Now you can get access to the cooling fan. 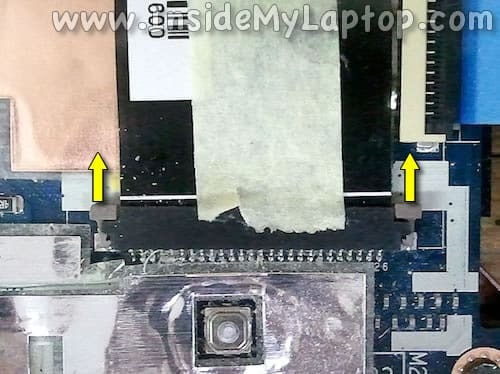 Remove the mylar cover between the fan and heatsink. 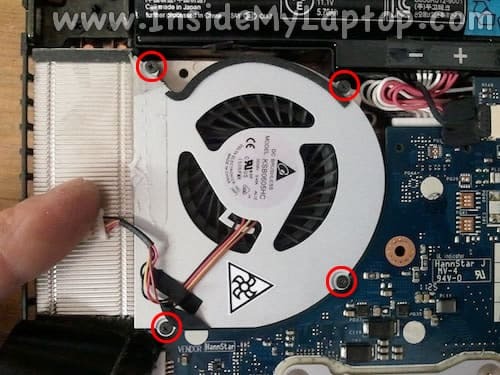 Remove four screws securing the fan assembly. Now you can replace the failed fan with a new one. Instead of replacing, you can try lubricating the fan first. Separate the vent from the motor. Apply a drop of multi-purpose oil on the fan pin and inside the motor, right in the middle. Assemble everything back together and test the laptop. 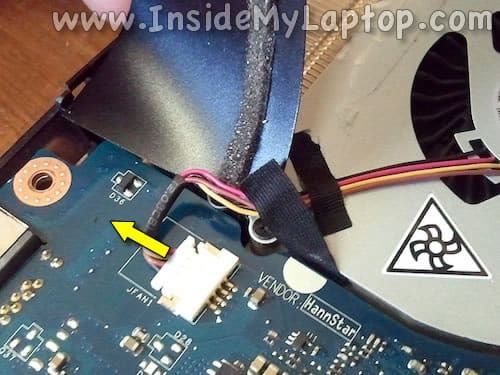 It’s possible that lubricating the fan will fix the noise problem. If not, you’ll have to replace the fan. 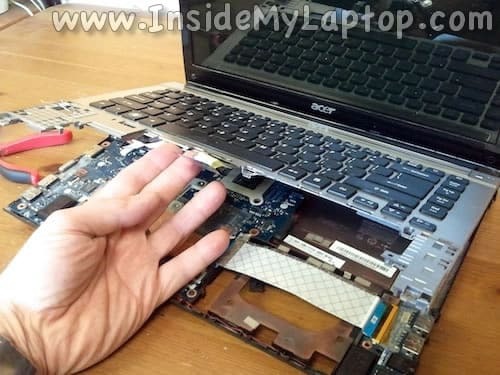 In the next guide I explain how to replace Acer Aspire 4830T screen. 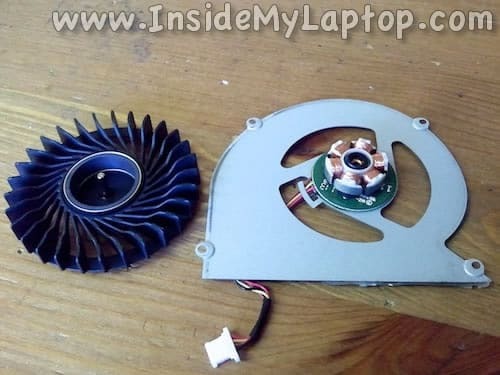 Is the fan blade supposed to just pop off the motor? 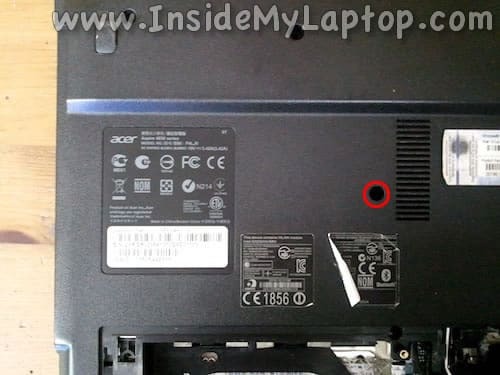 I’m trying to lubricate the fan in my Acer Aspire V5-571 but the blade won’t come off easily and I’m afraid to pull on it any harder. I’ve seen some say you can remove the sticker on the other side and underneath the sticker will be a rubber piece you can pop off and you can add the oil to the shaft/well that way, but there is no rubber piece to remove or any way to access the shaft this way either. Do you know how I can access the shaft or well on this particular model? My fan is making a terrible noise and until I can replace the fan entirely, I still need to be able to use my computer. Thanks! I have a 4830TG and the bottom case near hinge is broken to the point that the broken part sticks out every time the lid is closed. Do you know where I can possibly purchase the bottom case? I don’t mine buying generic or used ones. 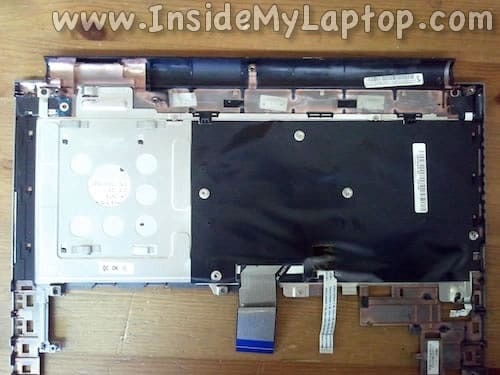 I could remove and clean the fan of my 4830TG, but when i assembled my laptop back, it is not starting up when I power on. 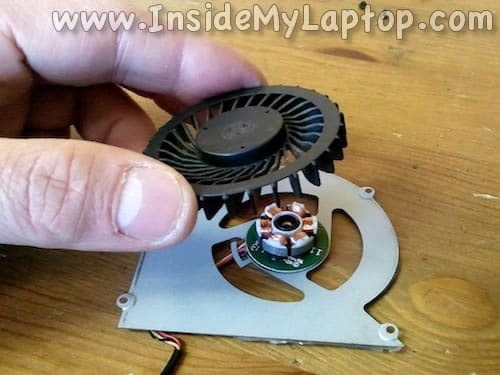 I can see the power light is on, fan rotating normally and USB ports also have power. 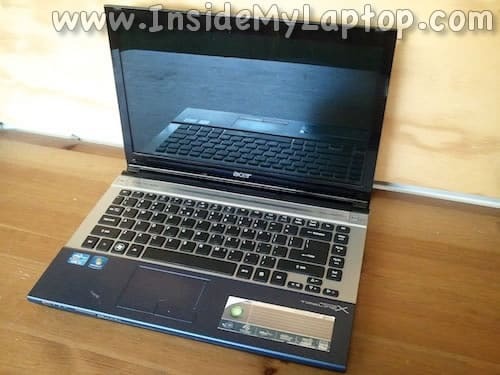 But the laptop just doesn’t start up and processor light doest not light up. 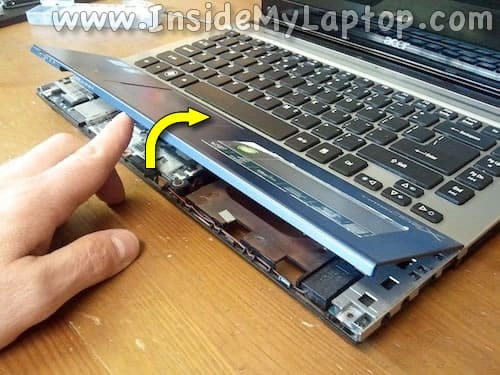 Can you advise how do I get my laptop started. 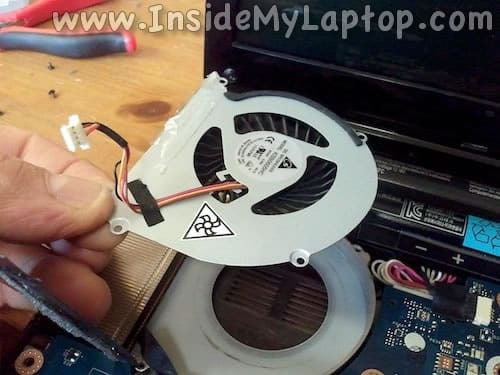 It’s almost perfect procedure and most helpful guide to replace fan. But, I had three small differences on my machine. 1) In step 9, there is NOT exist center screw in my machine. 2) Before step 19, there is TWO MORE connectors at most left side and right side. One is in left side of the keyboard frame. 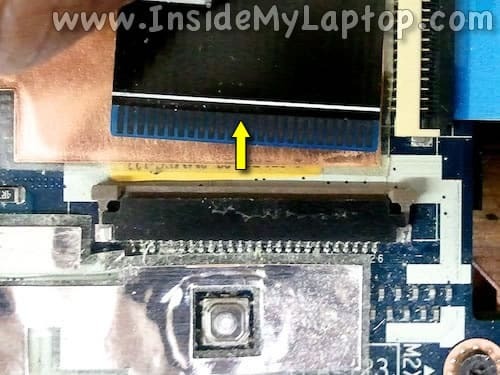 It’s thin small connector. 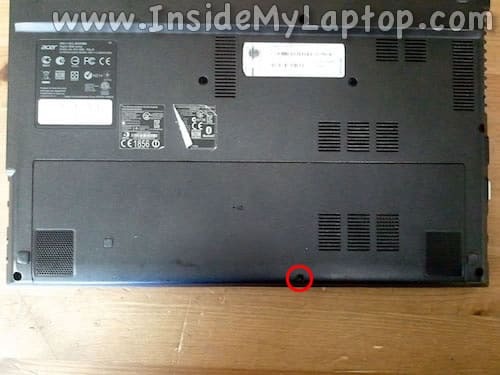 3) Another is in center of keyboard frame. It’s left to right thick cable. 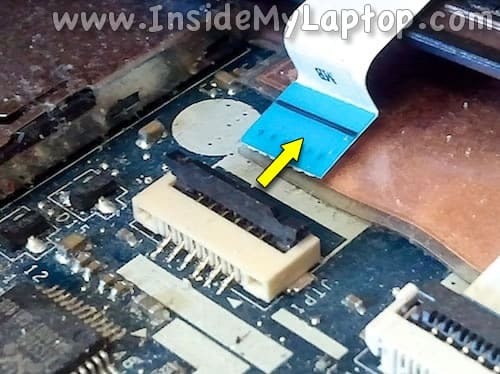 It is connected to USB port board at right side was fixed this on keyboard frame with screw. I’m very very glad at your helpful guide. I’ll donate a little for this. Thank you for these useful instructions. 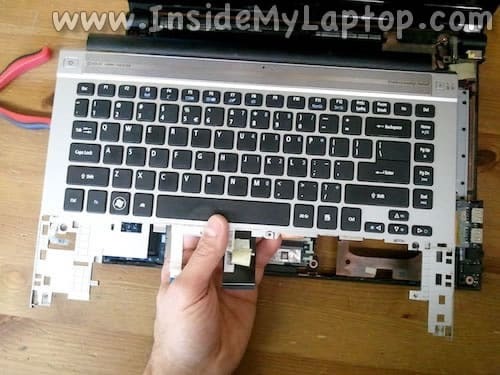 I had no trouble taking the laptop apart. Like Toshi, above, I also had to disconnect two more connectors before I could remove the keyboard. But to prevent anyone else having the problem I had, the fan requires a 0000 phillips screwdriver. (all other screws are a size 0) Before I figured this out, I destroyed the heads of 2 screws. Once I had the correct size tool, the other two screws came right out. So do yourself a favor and buy a 0000 Phillips before you start. 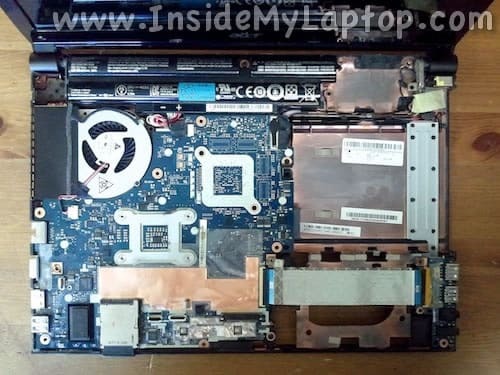 Now that I am in this predicament, my alternative is to remove the entire motherboard so that I can access the full fan assembly including the air channel. I’ve decided that is more than I want to tackle, so I am going to put the laptop back together and take it to a repair shop.